Israeli PM Netanyahu and Austrian Chancellor Kurz. Illustrative. Photo courtesy of Avi Ohayon (Israeli GPO). Two key leadership councils of the European Union have endorsed the call for member nations to adopt a definition of anti-Semitism that includes denying the right of Jews to have their own nation, and Israeli Prime Minister Benjamin Netanyahu on Sunday thanked Austrian Chancellor Sebastian Kurz for leading this effort. He also quoted Martin Luther King as giving the same definition of anti-Semitism. “I recently read a cogent remark by the noted American human rights leader Martin Luther King: ‘When people criticize Zionists, they mean Jews. 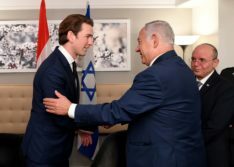 You’re talking anti-Semitism,’” said Netanyahu in comments released by his office, going on to thank Kurz for his leadership in the European Union adopting a similar definition. 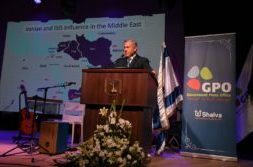 Speaking at the annual New Year’s toast for foreign journalists, Netanyahu was quoted by his office as pointing out that Israel is already militarily confronting Iran. “For the moment Israel’s military is the only military in the world that is directly engaging the Iranian forces. We’re doing that in Syria and pulling them back,” said the Israeli leader. Israel informed Russia on Saturday that they still intend to fight back against Hezbollah threats and Iran’s presence in Syria, despite the increase in tensions in recent months between Jerusalem and Moscow over the downing of a Russian plane in Syria last September. 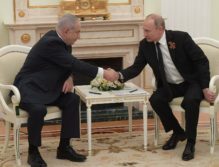 Per an Israeli press release, Prime Minister Benjamin Netanyahu told Russian President Vladimir Putin of Israel’s “continuing intention to foil the tunnels threat” from Hezbollah that was recently discovered. Pompeo even highlighted the holiday’s global significance for freedom, which marks Israel’s historic war for independence over Greek forces seeking to impose Greek culture and worship. “Tonight, the Jewish people will light the first #Hanukkah candle, beginning their celebration of the Festival of Lights. This holiday marks a historic victory for religious freedom. 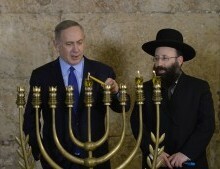 Chag Sameach to the Jewish community in the U.S., Israel, and around the world,” Pompeo posted to Twitter on Sunday. With the United Kingdom well on its way to exiting the European Union next year, they are looking for trading partners in a push for free trade—and that includes Israel. 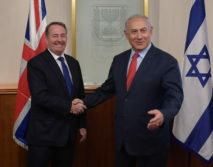 That was a key agenda point for British Secretary of State for International Trade Dr. Liam Fox as he met on Wednesday with Israeli Prime Minister Benjamin Netanyahu in Jerusalem. 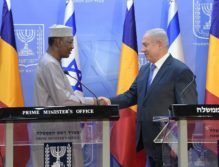 PM Netanyahu & Chad Pres. Deby. Photo courtesy of Amos Ben-Gershom (Israeli GPO).